Think you know what living in a nursing home is like?… Think again! 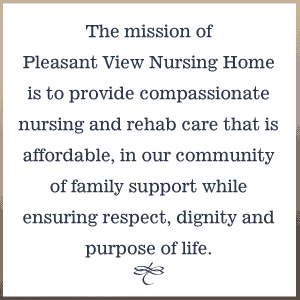 Located in the heart of Green County, Wisconsin, Pleasant View Skilled Nursing and Rehab lives up to its name. Surrounded by mature trees, rolling hills, and an extensive backyard garden area, residents enjoy their stay in a beautiful, natural setting. With 110 beds our facility has room for both long-term stays and short-term rehab. As a non-profit, county-funded facility Pleasant View bustles with activity. From Bingo to Therapy, residents are engaged with caring and attentive staff who work to provide a quality of life experience. Fully equipped for 24 hour skilled nursing care, our energy and attention are focused on the specific needs of residents who require these kinds of services. In the routine of day to day living, all departments address resident preference–from delicious menu choices to personalized comfort. Providing a clean and welcoming facility is a priority, and visitors are encouraged to come often and stay for a meal or special event. PLEASANT describes who we are, where we are, what we do, and how we do it. Come see for yourself! Contact us by phone or email. Or stop by for a tour.